This single wide is beautiful with a modern traditional decor! When Michelle and her family decided to give up city living and move into the country she knew it would be an adjustment. 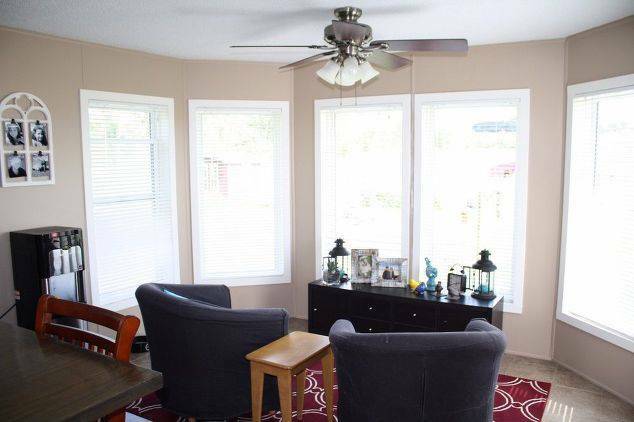 Not only was the move a complete change of scenery, the 20-year-old single wide they were moving into had been vacant for 2 years and was in desperate need of a makeover so that’s exactly what she did! Michelle and her family live in a gorgeous home now! Her style could be described as modern traditional decor with a cool farmhouse twist. Regardless of what you call it, the home is gorgeous and another great example of mobile home living. Michelle has mastered modern traditional decor. 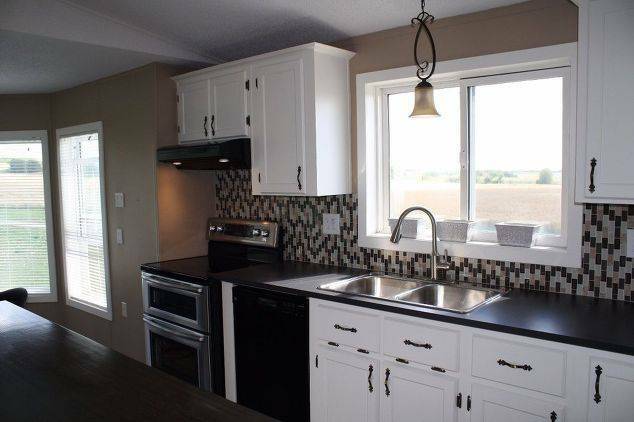 The first step of her single wide makeover story was to replace the old kitchen appliances with modern stainless steel. Flooring was also a top priority for Michelle. The linoleum had been there since the home was manufactured and had to go! She visited her local home improvement store and purchased industrial vinyl tiles. The linoleum came up easy and the new linoleum tile was easy to cut and install. Nothing can update the look of a home faster than paint! Michelle painted the kitchen cabinets a crisp clean white. She used the same steps we recommend. First. she cleaned the surface well and then used a primer coat of Kilz. She applied two coats of paint after the primer dried. 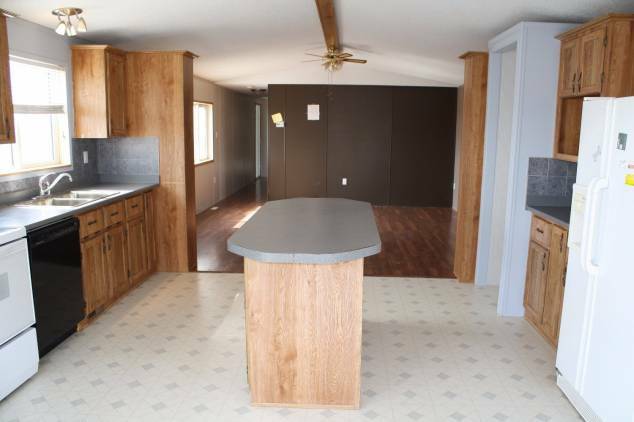 Related: You can read how to paint vinyl coated mobile home walls here. 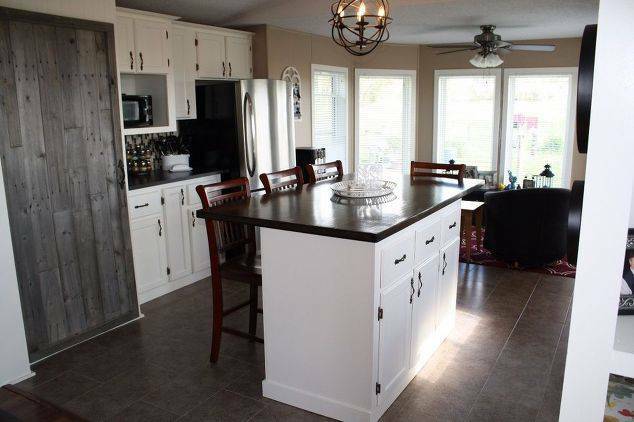 Michelle’s kitchen island needed an update as well so the counter top was removed and replaced with a pre-cut butcher block top. She coated the butcher block with 7 layers of Varathon. 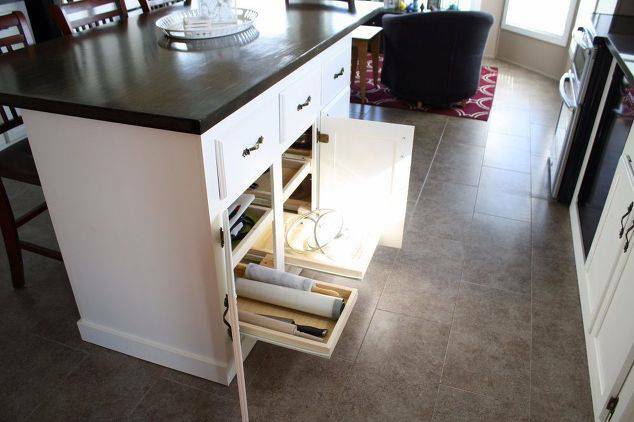 She also added a set of drawer slides for the cabinets under the island. 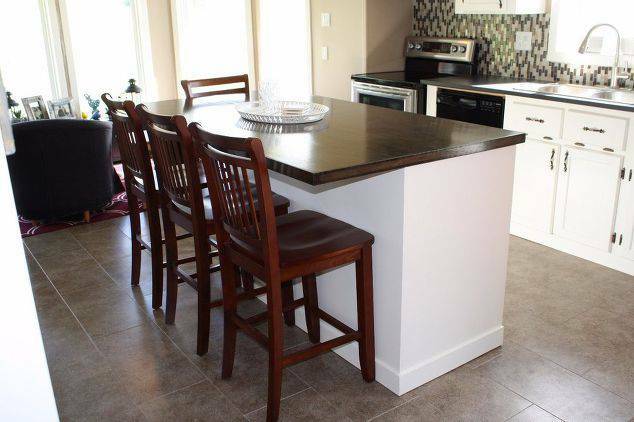 The remaining kitchen counter tops were replaced with an inexpensive black laminate. Black countertops on white cabinetry create a great contrast in a kitchen. They are easier to keep clean, too. 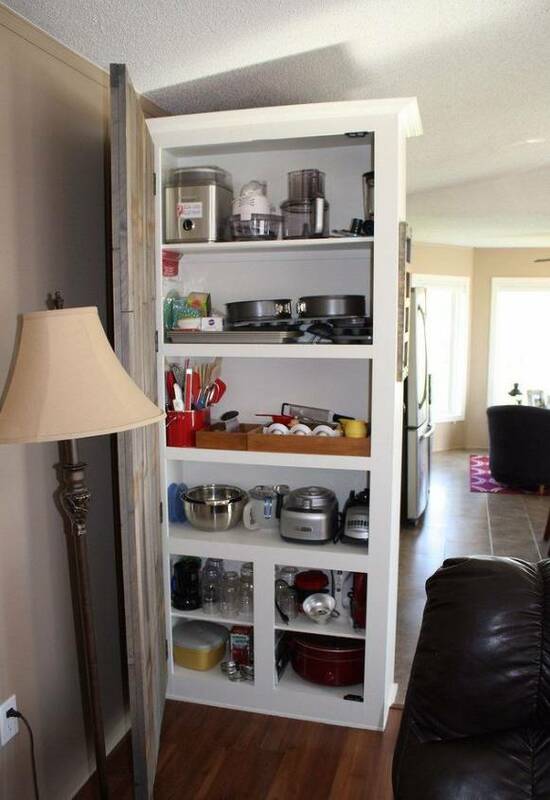 Don’t be scared to use the space in your home how you want to use it. 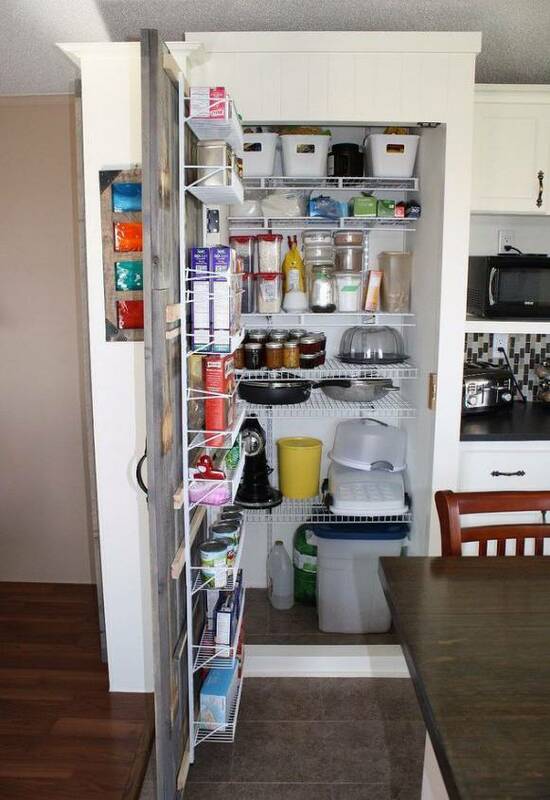 Regardless of how long or wide a single wide can be there are limitations to their layout. Sometimes a home comes with rooms we don’t need or rooms in the wrong place. One previous featured homeowner switched her living room and master bedroom around because she needed a home office in her bedroom. 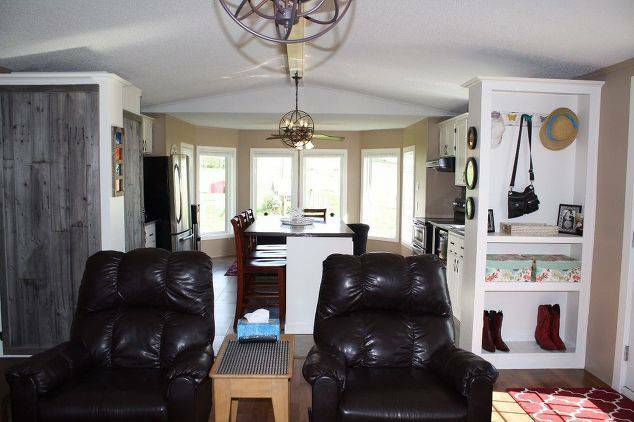 Related: Read about home with a bedroom in the living room here (it is amazing). Michele turned the unused dining room into a very useful sitting area. Now, her family can use the space in a way that fits their lifestyle and they get to see a beautiful view! 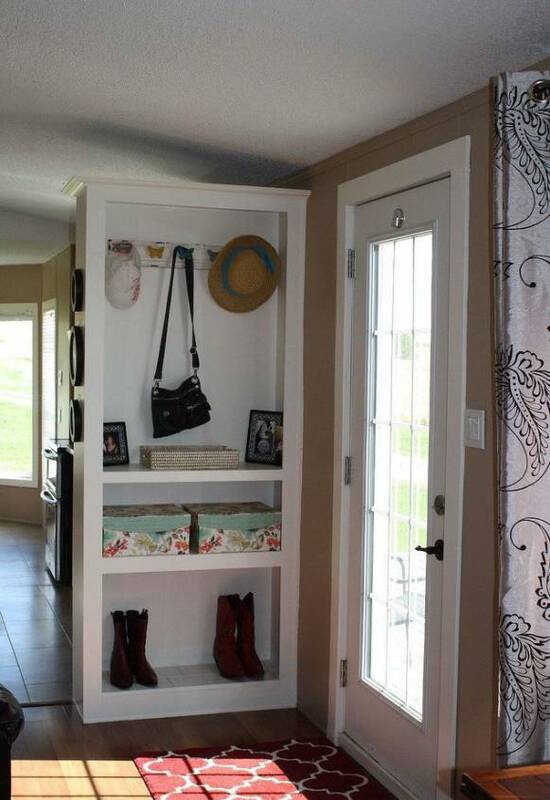 She also created a great entry way by putting a quarter wall to work with shelving. You can read more about Michelle’s gorgeous single wide with modern traditional decor here. First and foremost thanks for bringing to the world a very informative web-site on mobile home living. My wife and I are are from New York and are getting close to retirement. We purchased the most perfect piece of land in the world to retire to. It’s located in Columbia, North Carolina and it’s right on the water. The town we chose has that old time feel and decided that this be perfect for us to spend our golden years. The only problem we had, there was a 1970 single wide on the property and coming from New York we had that stereotype in our mind and we looked at this old trailer over the next few months we started to look at the mobile home not as burden but as a gift. Instead of getting rid of the trailer we decided to welcome it with open arms and embrace it. We decided to do a complete overhaul of the trailer. 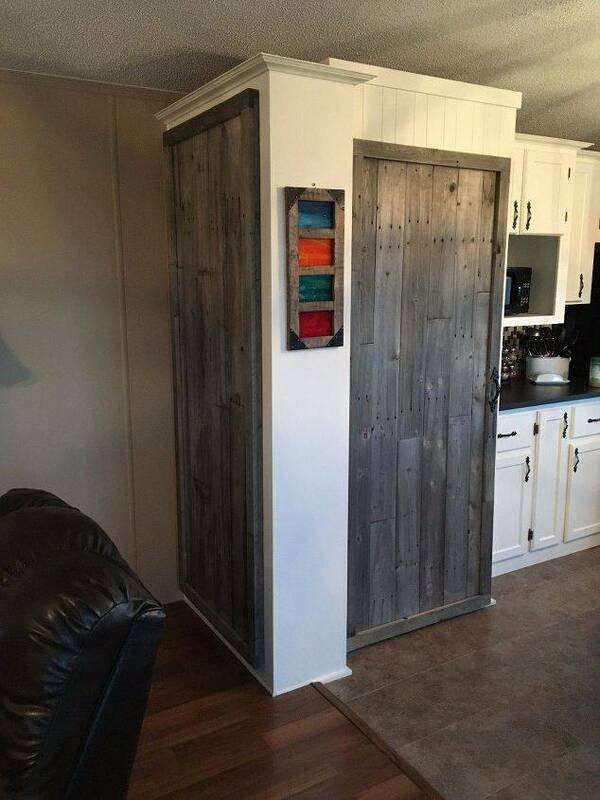 As we get older I believe down sizing to a mobile home will be the way to go. In the rehab we are going to go from 3 bedrooms and two baths, to two bedrooms and only one bath which will be perfect for us and a visit from the kids form time to time. I am so excited to see the final product when it’s done and as soon as it is done we will be sending you a host of be fore and after photos and hope that you will post them to your web site for other to view. Hi Paul! Thank you for the kind words and congratulations! Mobile homes aren’t perfect but they definitely have a place. Affordable living is easy living! Just let me know when you’re ready because I have a feeling you are going to have a beautiful home when you’re all finished. You can use [email protected]. There have been several new makeovers of both single wide and double wide MH pictorialized on this web site and they all are beautiful in their own right. As I have noticed the lighting in these homes I wonder how they manage to create new lighting with no fixtures in the ceiling. Is there a specific way to incorporate new lightng in the ceiling without taking out the sheetrock or is there surface mounted channeling from the outlet to the ceiling. I’m interested in installing new ceiling light fixtures without tearing out the whole ceiling. How do I get the new look? Lighting is a HUGE issue in older manufactured homes. You can always install new fixtures but you’d need to cut the hole in the ceiling and fish the new wire from the closest connection point. To keep from dealing with all that I’ve always just used lamps or hanging lights. One of the easiest tricks I”ve learned since starting this blog is how much uplighting can change a space and create a really nice ambiance. One of those little canister lights in a corner pointed to the ceiling will change the look of a room so much (with the right bulb). The LED lights are great (they have battery operated ones with remotes). You could probably attach one to the ceiling with a Command strip and create a nice little light without all the hassle of installation.